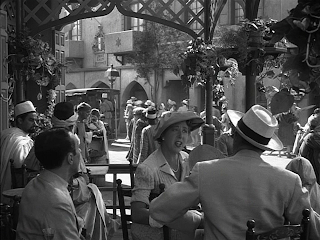 The first few minutes of Michael Curtiz's Casablanca (1942), leading up to the arrival of Major Strasser/Conrad Veidt, establishes the setting through several channels. 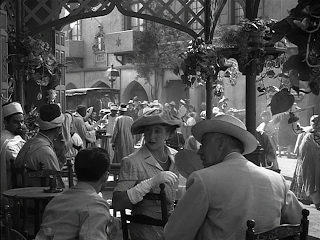 Following the opening credits, there's a brief narration, an establishing scene, exposition, a montage, a comic vignette and a crowd scene. It's unlikely that any of these things were in the source play, and the sequence points to how the film elaborates on the bare bones of the plot. 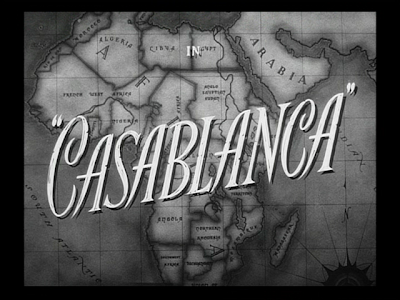 The film opens with a map of Africa behind the credits, with the title providing a more specific clue to the film's setting. 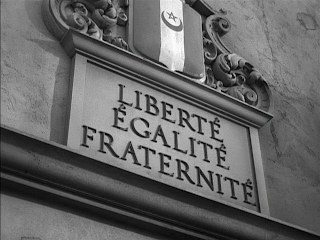 These visual clues are reinforced by Max Steiner's typically obvious score in which an exotic, African-sounding theme segues into "La Marseillaise." 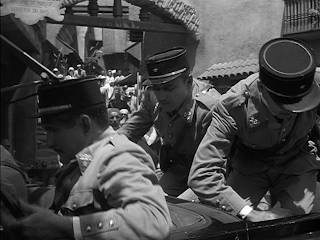 In the next sequence, the soundtrack dominates and even seems to dictate the imagery. 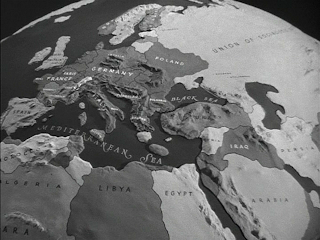 As the solemn off-screen narrator describes the path of refugees hoping to fly to America from Lisbon, the camera moves in on a slowly rotating globe. 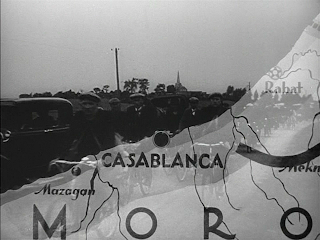 As the camera arrives on Europe, the film dissolves to a flat map with a line moving from Paris to Marseilles to Oran to Casablanca. 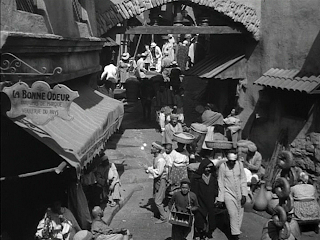 The camera begins close on Paris, moves out take in the Mediterranean Sea, and then moves in on Casablanca. 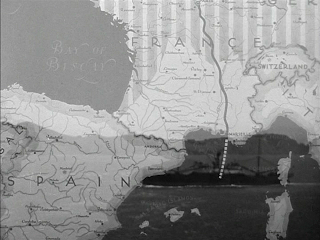 Superimposed over the map are stock images of people walking, then boats crossing the sea, and then more walking. Here the images neatly illustrate the text. 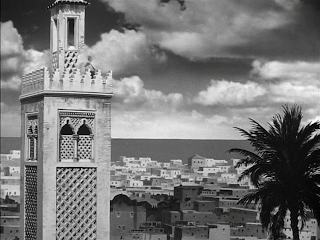 As the name of the city fills the screen, the film dissolves to a skyline. 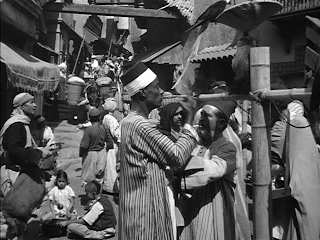 The narration continues as the camera moves down to street level before being over-taken by the ambient audio of a crowded market. 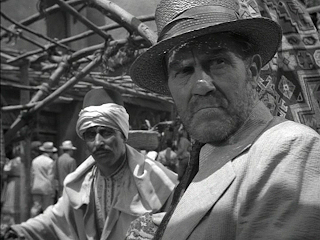 The score switches from portentous to an exotic, Arabic-sounding motif. 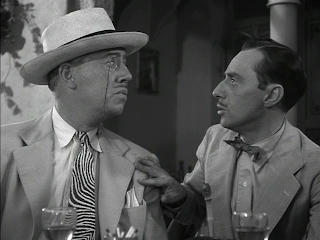 In the foreground, two men silently haggle over the price of a bird. 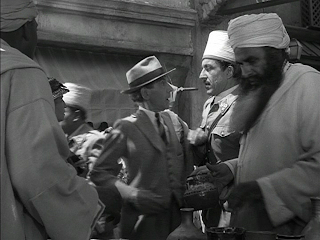 The narration never discusses the Moroccans themselves, who merely provide an exotic backdrop to the action, and all the speaking roles are for American or European actors. 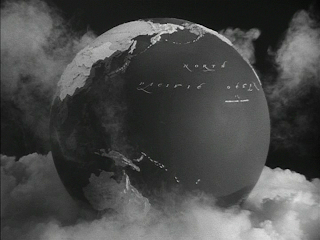 With another dissolve, the score turns portentous again. 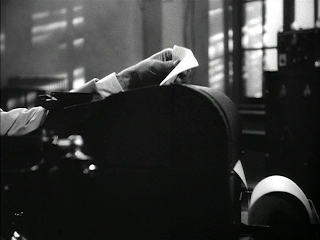 The scene opens on an insert of a hand taking a message coming over the wire. 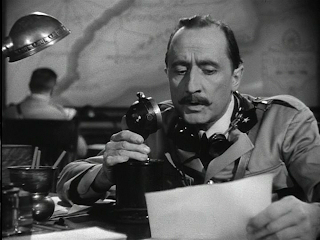 The camera pans left to a medium close-up of a uniformed man with a slight French accent who reads the contents of the message into a microphone. 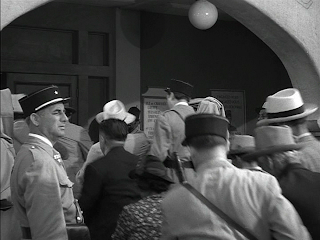 Again, the imagery neatly illustrates the text with the following sequence, a montage of arrests motivated by the uniformed man's order for police to round up "all suspicious characters." Both the tempo of the editing and the score increase dramatically. 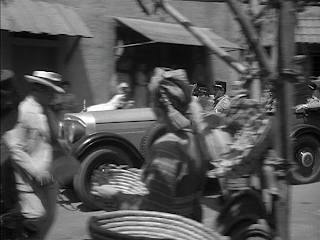 In quick succession we see: (1) a police office in medium shot blowing his whistle while looking off-screen left; (2) the camera panning left with a police car speeding down a busy street in long shot as the sound of the officer's whistle continues on the soundtrack; (3) a bearded man in medium close-up turning and looking off-screen right (it's not clear whether he's looking at the police officer or the car); (4) the police officer again; (5) a clean-shaven man walking towards the camera and looking off-screen right in medium close-up; (6) the police officer stops whistling and shouts something in French to some one off-screen left; (7) in medium long shot, a man standing an outdoor market is grabbed by a police officer in an Arabic hat; (8) another long shot panning with the police car; (9) the police car coming to a stop and police officers wearing French hats jumping out, exiting the frame right; (10) moving left, police officers in Arabic hats fighting their way through a crowd in medium long shot; (11) moving left, as if continuing the same motion, police officers in French hats grabbing a man in a grey suit and hat; (12) looking off-screen left, as if observing the previous shot, a man in a white suit and hat in medium close-up turning and running away from the camera where he's quickly nabbed by police officers in French hats; (13) the camera panning right with a French police officer in a black suit as he leads two suspects to a police van in medium shot with more suspects following behind. 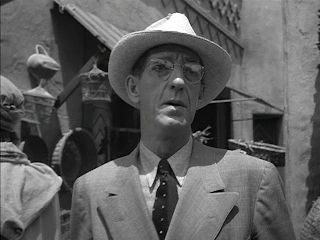 This sequence is pure montage, juxtaposing various elements rather than constructing spatial continuity through matches on action or matching eye lines. 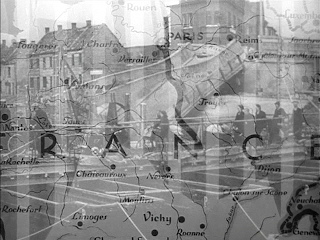 At first, the next scene appears to be a continuation of the previous montage but arrives at a different place altogether. 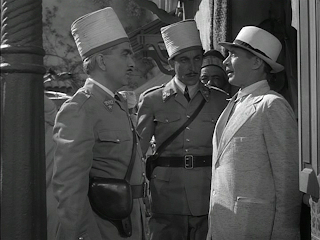 Two police officers in Arabic hats ask a man in a light grey suit for his papers. 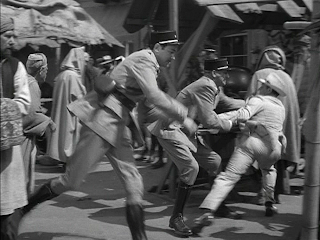 When one of the police officers says his papers are expired, the man in the light grey suit tries to run away. 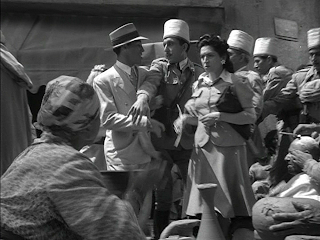 The camera pans left on the action, resting on Annina/Joy Page and her husband, who will appear again throughout the film. They look off-screen left. In long shot, the man in the light grey suit continues to run. 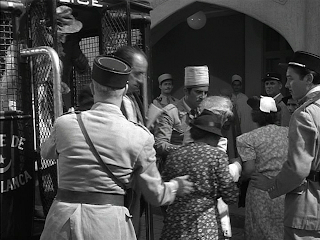 The police officers in Arabic hats enter the frame on the right. One draws his gun and fires. 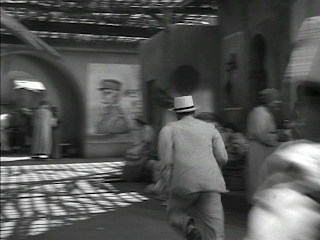 On the sound of gun shot, the camera cuts to a closer angle of the man in the light grey suit as he falls down in front of a mural. 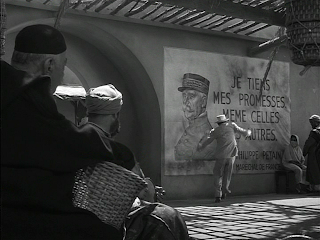 The film cuts to a tighter shot of the mural. 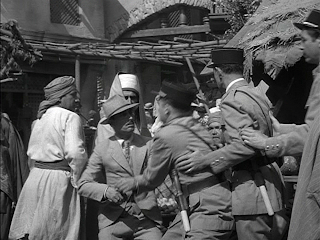 As the police officers in Arabic hats enter the frame, the camera pans down to the dead man's body. 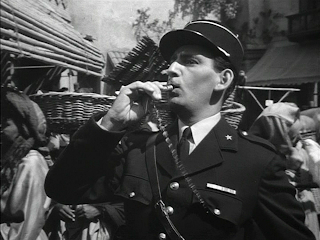 One of the police officers in Arabic hats takes a piece of paper from his hand and hands it to the other officer, who holds it up to the camera so we can see that it reads "Free France," identifying the dead man as a member of the resistance. Here again the tempo of the editing and the music quicken as the drama intensifies. 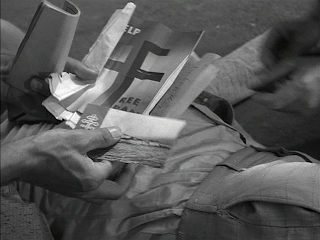 The film cuts from the Free France poster to a sign that reads "Liberté, Égalité, Fraternité" that hangs above the doors of the Palais de Justice. 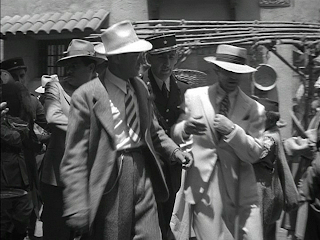 The camera pans down to show the men who were arrested in the round-up being brought inside. 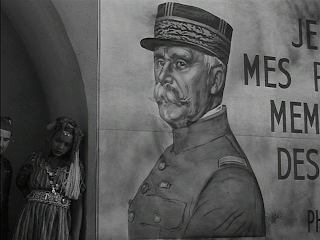 This associative edit is reinforced by the use of "La Marseilles" again on the soundtrack. 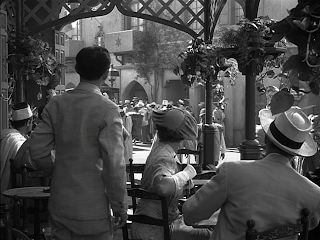 The film cuts to an outdoor café adjacent to the Palais de Justice, although we cannot see the building in the shot. 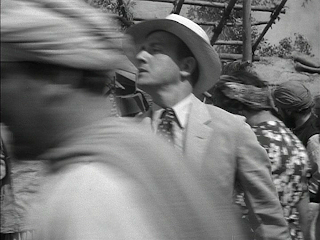 A British woman and her husband in the bottom center and bottom right corner of the frame are trying to get a look at what's going on, their backs to the camera. 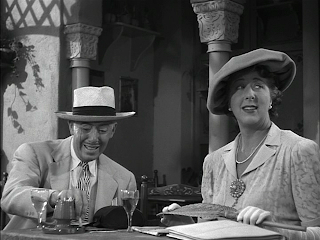 The woman turns to ask her husband what's happening, revealing her face to the camera. 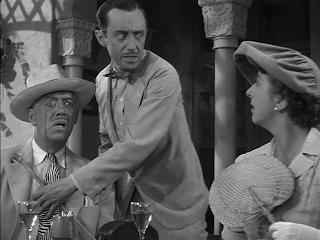 A sneaky-looking man in the bottom left corner of the frame interrupts, and both the woman and the man turn to face him, making the husband's face visible for the first time. Explaining the situation to them, the man stands up and all three turn away from the camera. 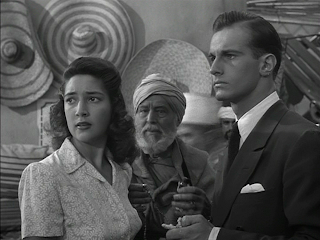 The sneaky-looking man turns to face the couple, making his face visible again from the side-on, and the woman turns to look at him, making her face visible again. 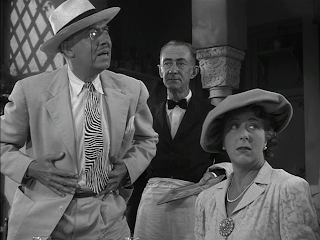 Since she is facing the camera front-on, and she is located in the center of the frame, we are apt to look at her reactions even when the sneaky-looking man is speaking. 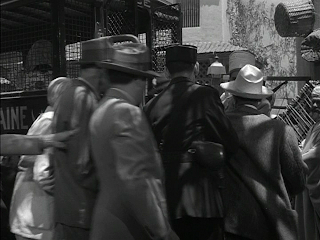 The film cuts to a shot of suspects getting out of a police van, following by a match on action as the suspects move towards the doors of the Palais de Justice. 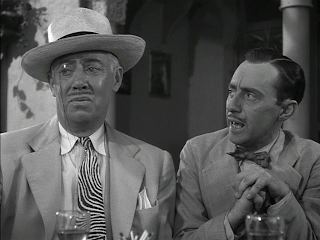 The film cuts back to the outdoor café where the sneaky-looking man is now sitting beside the husband in a medium close-up. As he rises, and puts first one hand on the husband's shoulder and then another on his chest, the camera dollies out to a medium shot. 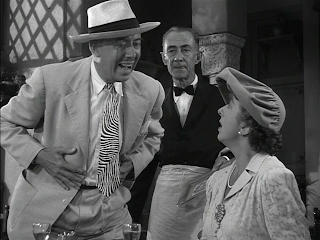 Putting out his cigarette, the husband stands and calls for the waiter. He touches his chest, realizing his wallet's missing. 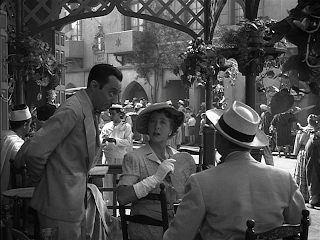 The waiter enters the frame from the right and stops in the center of the frame between the woman and her husband. 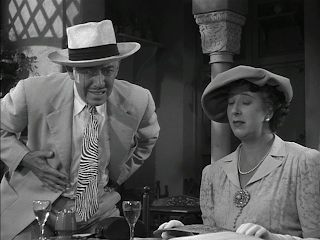 Here, the film displays a light touch: we don't see the sneaky-looking man taking the husband's wallet yet we comprehend that he took it from the way he puts his hand on the husband's chest. 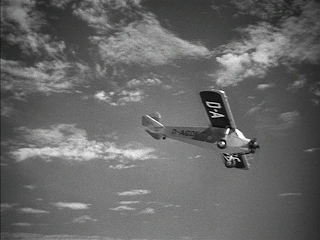 On the soundtrack we hear the sound of an airplane, and both the woman and her husband look off-screen right. 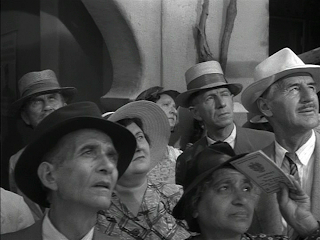 The airplane sound continues as the film cuts to a crowd gathered on a sidewalk looking up and off-screen right. 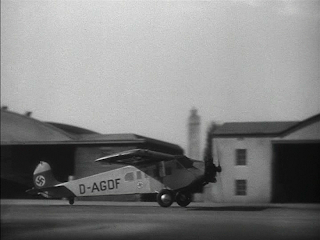 A plane flies across the screen from left to right and down. 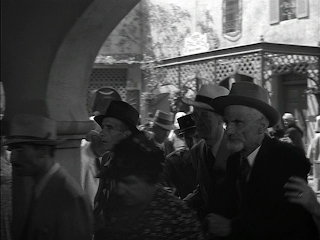 The film tracks across the crowd, moving like the plane from left to right. 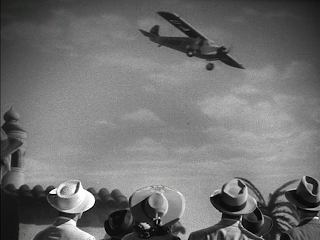 In the reverse angle, a row of people standing at the bottom of the frame are turned away from the camera towards the plane which continues its descent. 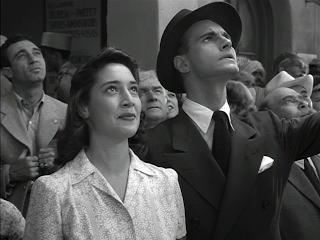 In medium close-up, Annina and her husband stand in the crowd looking at the plane with hope in their eyes. "Perhaps tomorrow we'll be on the plane," she says. 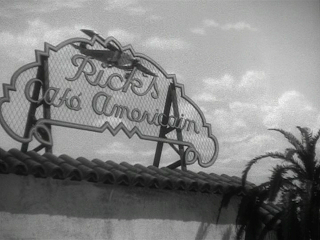 As the plane continues its descent, it passes Rick's Café Americain, establishing the film's principal location. As the plane touches down, we can see that a swaztika is painted on the side. 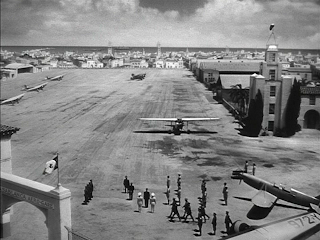 The sequence ends with a wipe to a high angle establishing shot of the air strip. 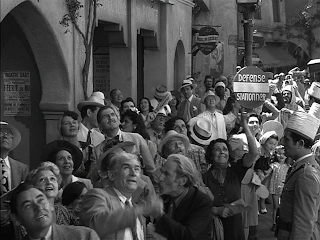 Although the people standing in the crowd see the plane as a beacon of hope, it is ironically bringing Major Strasser, the film's Nazi villain, to Casablanca. 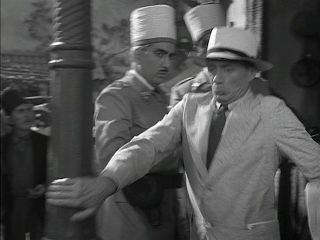 This image is echoed in the film's final scene as Victor Laszlo/Paul Henreid, the film's resistance hero, and his wife, Ilsa Lund/Ingrid Bergman, leave Casablanca by plane for Lisbon. 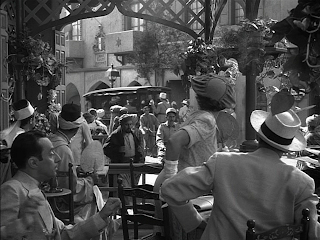 As the title suggests, Casablanca is a film in which the setting plays a significant role. It's worth noting that the title of the play it was based on was "Everybody Comes to Rick's," and it was promptly forgotten. Although there were no doubt changes made to the story in making a film, more importantly, what the film has that couldn't exist on the stage is its atmosphere. I doubt anyone would remember Rick/Humphrey Bogart's speech to Ilsa at the airport if there wasn't all that atmospheric fog behind him.